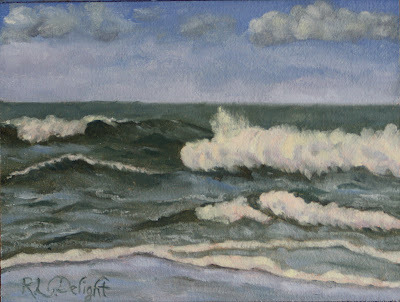 I painted the wave study for this painting (wave study #11) on 12/12/12. Hence the title "Just an Ordinary Magical Day". There is also something rather magical to have the ocean roaring in the background as I was painting this in my studio today. I have to be honest though, I like the wave study better than this studio painting! My back is really hurting for some reason and I was not as patient with the behavior of the paint as I usually am. These things show up in the painting. The stories paintings could tell if they could talk! Today I just realized that I only have fifteen of these panels. I have used five of them and I have fifteen days that need panels beyond what I have. I will have to order more. Speaking of ordering, all of the challenge paintings will be on the my DailyPaintworks gallery site and are available to purchase. I will be donating a percentage of the proceeds to one or more animal rescue groups I have in mind, including our local United Paws of Tillamook. I will get that up on the auction site and determine the percentage soon. Weather and my back permitting, I will be heading out to paint en plein air again tomorrow. I am thinking that I would like to try painting directly onto a panel instead of the loose hemp canvas that I currently have. That means I will essentially be selling one of my painting references. I have mixed feelings about that. It would save me precious time to combine the wave study and challenge in one painting. I also tend to generally like the plein air paintings better than the studio ones. I would need to finish the paintings in the studio. There are a few drawbacks as well so I believe I will need to sleep on it. I would at least like to try it to see how well it would work. I will stop this post here. I am babbling, a sure sign that I need sleep! Thanks Theresa! It will be interesting to see where this will lead. Unfortunately today is foggy as well as rainy which means visibility is very poor. 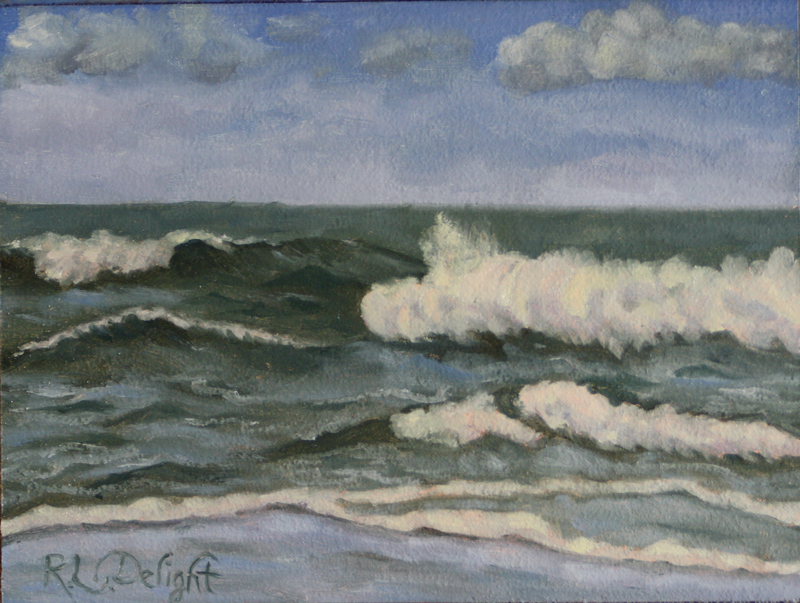 Hard to see the waves so, another studio painting for me. I can't wait to get out and try starting the painting plein air and finishing in the calm of the studio. Might be a good solution.